Each time a new President moves into the White House, they get the chance to redecorate. And each have added their own stamp onto the mansion… Barack Obama added a basketball court, Richard Nixon added a bowling alley and Gerald Ford built an outdoor swimming pool. Of course, there are limits and the state rooms can’t easily be altered, but the living quarters in the 132 room mansion are located on the top 2 floors and it is here that the First family have significant leeway. Now that Donald and Melania Trump have the keys, how might they choose to personalise the space? Comprising the top three floors of Trump Tower, the interiors of Donald and Melania's home were designed by Angelo Donghia in Louis XIV style and decorated using 24K gold and marble. The Trump's Breakfast room is no less palatial. The extravagant decor throughout the house takes inspiration from the Palace of Versailles in France. Donald Trump's rather ornate office continues the focus on neutral shades of cream and gold in a Rococo style. Recently, Melania’s make up artist Nicole Bryl gave away a small glimpse of what to expect: “There will absolutely be a room designated for hair, makeup, and wardrobe”. And who wouldn’t want a dedicated ‘glam room’?! But if the new First couple need more inspiration, they should look to history and glimpse at the interior design archives of previous Presidents. Here is a tour of the White House as you’ve not seen it before. Come through the front door and enter into the family’s personal dining room and master bedroom as they’ve changed over the last 100 years. During her husband William's time as President, Nellie Taft decorated the interiors of the White House with influences from their travels together. In particular the 3 years they lived in the Philippines: oriental and Japanese furniture, screens, floor mats and tapestries, as well as teakwood chairs, palm trees and Eastern fabrics with gold dragons on rich backgrounds. Beautifully decorated using a large oriental rug and dark furniture. The tall mirror shows off the room's high ceiling. William and Nellie Taft's bedroom in 1911. Over 100 years later it's still a timeless and comfortable room. These decades saw much change within the interiors of the White House. In the 1940s it became clear that the building was in serious need of renovation. And by the time Truman was elected in 1948 it was in a dangerously dilapidated state. The entire interior of the main body of the house was rebuilt. This photo of the family dining room was taken in 1948, before the reconstruction work began. Now in 1952, Truman added this chandelier to the private dining room, which at once gives it a greater sense of grandeur. The master bedroom pictured here in 1952. It was used as a living room by the Truman family, the walls were painted lavender and grey. The master bedroom in 1958, back to being a bedroom and decorated by Mamie Eisenhower. Her fondness for this shade of pink sparked a national trend for pink clothing, homewares and bathrooms. It was also Mamie Eisenhower who was the first person to initiate Halloween decorations to be put up in the White House. After her husband became President, Jackie Kennedy sought to restore the interiors of the White House to their former glory. She felt that the White House was an important symbol to the world and that internally it needed to showcase the best of America civilisation. Previously, furnishings and other items from the White House were taken by ex presidents and their families after their tenures, leading to a lack of original historical pieces. She initiated a Congressional bill to prevent this from happening in the future, she wrote to donors to try and track down pieces of interest, she modernised the private family apartments and established a committee to oversee and fund the restoration. Her work has left a lasting legacy. The family dining room in 1962. The master bedroom in 1962. John & Jacquie Kennedy preferred to have separate bedrooms, so although this was traditionally the master bedroom for the President, it was Jackie Kennedy's personal bedroom. Blue was the dominate colour here and she brought the curtains with her from her former bedroom in Georgetown—a choice she later regretted, calling the fabric “rather country-type material” that didn’t fit with the White House’s neoclassical style. A complete change to yellow from Pat Nixon in 1969. She also had a keen interest in artefacts and built upon Jackie's legacy, adding more than 600 paintings and furnishings to the White House and its collections, the largest number of acquisitions by any administration. In the early 1970s, Gerald and Betty Ford were unexpected occupants of the White House due to the resignation of Richard Nixon. Prior to this they were more concerned about their own family lives and then within two weeks of assuming her position, Betty was told they had to organise a state dinner for the King of Jordan. It wasn't until the start of the 1980s that the interiors of the White House were completely re-modelled by Nancy Reagan. She loved the colour scarlet and used it a lot throughout the mansion, commissioning the official White House china in the same shade. Betty Ford pictured here in 1977 on the day before Jimmy Carter's inauguration. She re-instated the headboard from Mamie Eisenhower's time. Nancy and Ronald Reagan’s bedroom in 1981 was a cream-coloured space lined with hand-painted chinoiserie wallpaper depicting flocks of birds perched in a grove of bamboo. When Bill Clinton was President, the interior redecorations, costing $396,000 from private donations, were extensive: 73 pieces of furniture and furnishings were re-covered, 23 pieces conserved, 74 items retrieved from storage, two floors repaired and re-covered. Twenty-eight windows got new curtains; 19 worn carpets were replaced; 11 chandeliers were conserved. 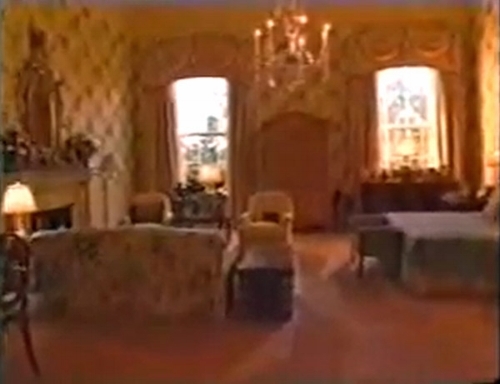 The Clintons chose strong colours in some of the State rooms and went for a Victorian look and feel. The private areas below show a lighter and toned down choice of decor. When Bill Clinton was president, Hillary loved decorating with yellow. A very grainy image of the master bedroom during Bill & Hilary Clinton's time at the White House, but this administration did not release any other pictures of their private rooms. There is still a sense of their style though with lots of pattern, curtain swags and a feel that the main colours are yellow and cream. One of the first acts Michelle Obama did when she entered the White House was not to the interiors, but to the outside of the mansion. She planted a kitchen garden which produces fresh, seasonal food for the First family and their guests and is open to schools and visits. Her decorative touches inside however, are a real triumph and reflect not only the Obamas tastes, but also their values and interests. The Obamas have created a lovely dining room and put a very modern stamp on this traditional home. The painting on the left is by pop-art painter Robert Rauschenberg and is only the fourth piece of contemporary artwork to join the White House collection. The painting on the right is by African-American Expressionist painter Alma Thomas, the first African-American woman to have her work hung in the White House. Michelle Obama has talked about adding 'new voices to the national conversation' and this idea was behind many of her choices. Michelle & Barack Obama's master bedroom is described as their 'sanctuary'. Decorated in beige tones with a soft green running through, the bed has an antique canopy. It gives the feel of a very luxurious hotel room, comfortable and elegant. Do you have a favourite era? I still love Nellie & William Taft's elegant and timeless designs... Donald Trump has reportedly said that he doesn't want to change the decor too much - not surprising after Barack & Michelle Obama's tasteful make over - but time will tell. Watch this space!